Abduction and adduction. From Clinical Anatomy for Medical Students (3rd ed.) by Richard S. Snell (Little, Brown & Co., 1986). Abduction (Latin ab = from, and ductum = led) is the movement of a body part away from the axis or midline of the body in the coronal plane. 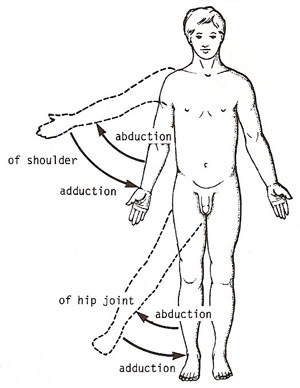 In the case of the fingers and toes, the term abduction refers to the spreading of these structures, i.e., their movement away from the axis of the limb. Muscles that carry out abduction are called abductors and are largely found in the limbs and neck. The opposite movement to abduction is called adduction.